OK. I just suffered a fairly hair-raising situation with my new baby. Due to my own carelessness, I dinged the Jaeger a few times and wanted to polish them out. I got a few types of polish including one designed for delicate metals and tried to do it by hand. BAD IDEA. This created a fog of fine scratches that only I could really see but that drove me crazy nonetheless. So I tried Flitz by hand. More scratches. I was at wits end. The only way to polish stainless steel is with a polishing paste and a low speed felt Dremel head. 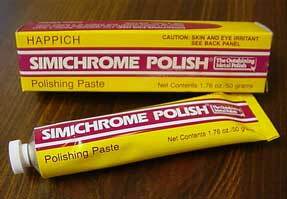 I began by cleaning the surface and I applied a very small amount – just the tip of a pencil’s worth – of Simichrome, which is available at auto stores. I then buffed the portion covered by the paste to a full shine. I continued this around the bezel and on the lugs where there was some fogging. The result? A clean, clear surface. I could keep going as there is a very small fuzz on the edges but I’d rather not. Polishing a case is like tanning – by the time you think you’re done, you’re already dead. You can also use something like Green Rouge on a Dremel. 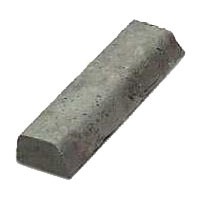 This is a fine clay-like material that will rub off on a Dremel tip and the polish steel with a striking shine. I used both of these techniques. I’m a newbie watch collector and was wondering about this very thing. Thanks! You should try out the Branson Ultrasonic Cleaner….it works wonders…my watch looks brand new! I wold love to see some pictures before and after. simichrome is something of a miracle product to me. I discovered it years ago for old coins and I always keep a tube on hand now. It always seems to work on any metal problem.